Chiriya Keawcharoen-Moore was born in Thailand and immigrated to the U.S. in 1976. She entered Kapiolani Community College on Oahu where she studied culinary arts. Chiriya met her future husband, John, while living in Hawaii. 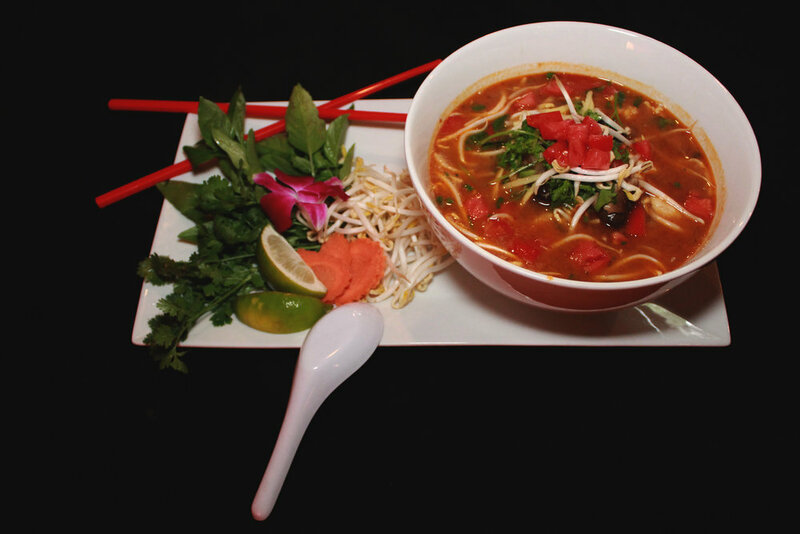 In 1996 the family moved to Savannah and in 2006 Chiriya opened the first Chiriya’s Thai Cuisine in Chatham Plaza. 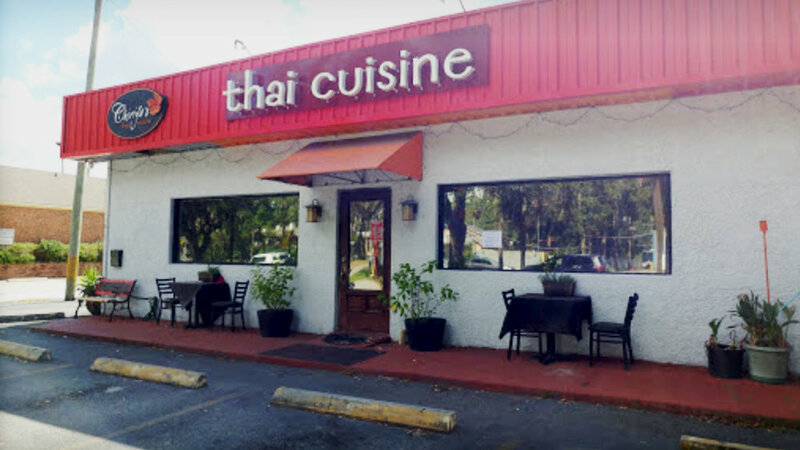 She successfully brought together her native Thai culture and her love for Hawaiian culture and put her restaurant on the map as the best restaurant for Thai and Hawaiian cuisine in Savannah. In December 2012, Chiriya's on Chatham Plaza closed its doors and found it's new home on Victory Drive in Thunderbolt in May 2013 with her son Justin, as her partner. Chiriya's sister Miss Bee and niece Pupa can be found helping create the amazing spring rolls and prepping the kitchen. While Chriya's other sister Vasannan and niece Narisa, also known as Jum, waitress. Healthy soybean that is stir-fried in our special teriyaki sauce. Lightly battered tender deep-fried calamari. Served with a side of tamarind dipping sauce. Delicious steamed mussels served in a refreshing green curry broth (medium heat) or massaman curry (mild). Mixed greens & carrots. Served with creamy basil or lemon-grass dressing. Thinly sliced grilled steak with onion, carrot, mint, and cilantro. Served over salad with lime dressing. Mixed‎ greens, carrots topped with grilled chicken. Served with peanut sauce dressing. Ground chicken or pork lightly turned over a hot fire with green onions, cilantro and Thai spices. Served with cabbage. Lemon-grass, mushrooms, ginger, garlic, tomatoes and lime juice. Coconut milk, mushrooms, lime juice, ginger, garlic and lemon-grass. Noodles with lime juice, mushrooms, tomatoes, ginger and garlic. Thin rice noodles, stir-fried with egg, bean sprouts, chive, and ground peanuts. Wide rice noodles stir-fried with broccoli, onions, and eggs. This dish is very popular among locals in Thailand. Chiriya’s signature noodle dish! Stir-fried egg noodles with broccoli, carrots, and cabbage. Wide rice noodles stir-fried with basil leaves, onion, red curry, carrots, bamboo shoots, green beans, and broccoli. Cashew nuts, onions, carrots, green beans, bamboo shoots, broccoli, and garlic. Fragrant garlic cloves are cooked to perfection with onions, carrots, green beans, bamboo shoots and broccoli to make this dish a favorite. Fresh Thai basil stir-fried with onions, carrots, green beans, bamboo shoots and broccoli. Fresh ginger, stir-fried with onions, carrots, green beans, bamboo shoots, broccoli, and mushrooms. Coconut milk, onions, carrots, green beans, bamboo shoots, and potatoes. Coconut milk, onions, carrots, green beans, bamboo shoots, and broccoli. Coconut milk, onions, carrots, green beans, bamboo shoots, potatoes, and peanuts. Coconut milk, onions, carrots, green beans, bamboo shoots and pineapple. Delicious duck breast seared to a golden crisp and topped with basil sauce. Served with jasmine rice. Fresh grilled salmon topped with an Asian pesto sauce. Served alongside grilled shrimp. Served with jasmine rice. 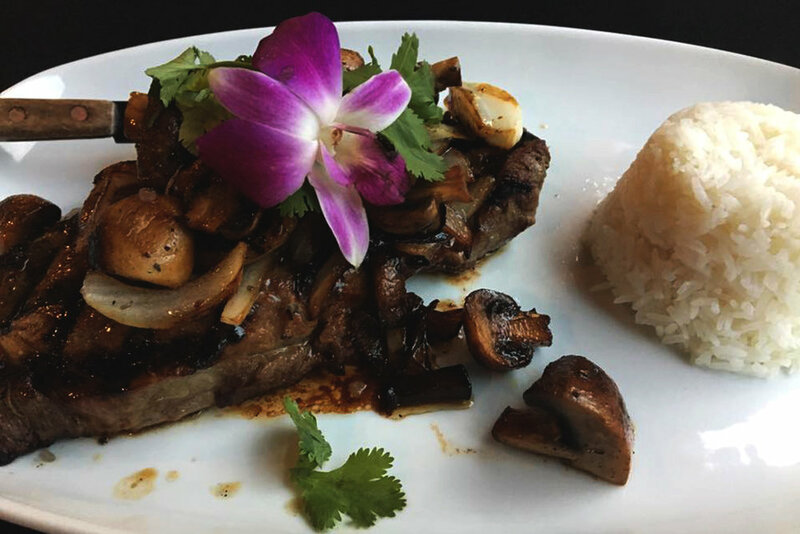 Half chicken marinated in our special Hawaiian seasonings and topped with Thai basil sauce. Served with jasmine rice. Stir-fried jasmine rice, pineapple, eggs, onions and mixed vegetables. 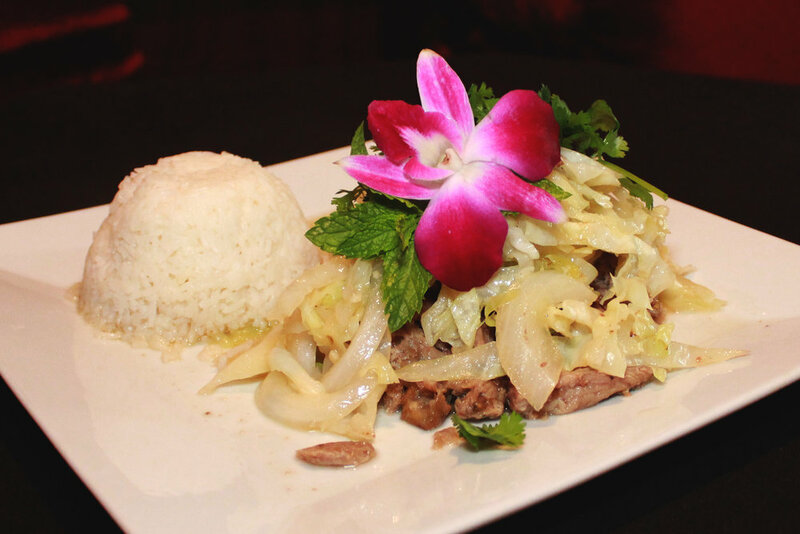 Smoked pork that has been slow roasted in banana leaves and stir-fried with cabbage, onion, and Hawaiian sea salt. Served with jasmine rice. Shrimp, calamari, & mussels sautéed with basil, onions, and bamboo shoots. Served with jasmine rice. Wide rice noodles, onions, carrots, green beans, bamboo shoos, basil, and broccoli. Thin rice noodle soup and bean sprouts. Grilled with our homemade teriyaki sauce and topped with lettuce tomato and pineapple. Grilled hamburger topped with our special gravy, a fried egg, and rice. Smoked pork that has been slow roasted in banana leaves, cabbage, and rice.